Hi there! We are Sound Gorillas, an independent audio production outfit producing audio dramas and much more. Sound Gorillas consists of the two apes that are called Johnny Robinson & Jelmer Lelieveld. 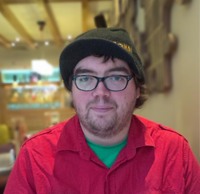 Johnny has experience in presenting and producing for community and commercial radio in Swindon. These stations include: Swindon FM, Swindon 105.5FM, was part of the sports team at Brunel FM and completed work experience at Original 106.5, Dearne Fm, and Brunel Fm (again) including two RSL broadcasts. Johnny loves to tinker with audio and the imagination; he has been head of music for Tone Radio, the student radio station of the University of Gloucestershire, and also (co)presented shows for Tone such as: The Johnny Robinson Affair, In The Dark, Prick Up Your Ears and the entertainment/panel show It’s Not Rocket Science. Please don’t feed a Johnny Robinson if you come across a one, as you risk your giblets. Jelmer is a Dutch native and has experience in presenting and producing for local public service radio WOS Radio and local commercial radio in the Netherlands, community radio station Bush Radio in Cape Town and KRO Radio 2. Jelmer loves experimenting with sound and the imagination, he has previously been involved with Tone Radio, the student radio station of the University of Gloucestershire, where he (co)presented and produced shows such as: In The Dark, The Crazy Dutchman, Radioholics Anonymous and the entertainment/panel show It’s Not Rocket Science. If you come across a wild Jelmer Lelieveld and you would like to catch one, try to lure it with typical Dutch food such as a kroket, ontbijtkoek or poffertjes. 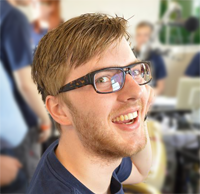 Both Jelmer & Johnny are 2014 BA (Hons) Radio Production graduates from the Skillset accredited Radio Production course at the University of Gloucestershire.